I thought it was about time I sent you a picture of Skooter. 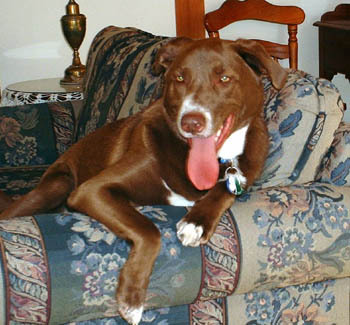 I adopted him in May 2003 (at the Adoptathon at Petco in Natick) when he was a little brown pup named Tuffy. As we suspected, he's not very tough, and I renamed him Skooter (to go along with his feline sister Skeeter). We knew he was an incredibly sweet dog, but never guessed he'd grow to 65 pounds! He's a little over a year old now and loves his family, his cat, his yard, and romping with his canine cousins. Thanks so much for Tuffy/Skooter - I can't imagine life without him!